The driving forces of the East African Rift System that are shredding the eastern part of Africa have been debated for decades. 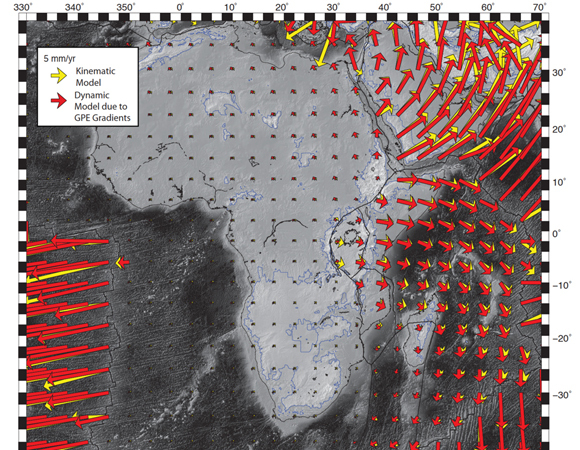 Using geodetic data from GPS stations and other seismic data the authors model plate motions that they use to decipher the forces sustaining present-day rifting. The models show that density variations within the lithosphere, causing gravitational potential energy (GPE) gradients, are enough to explain current rifting. Other forces and/or weakening processes, such as those from mantle upwelling, are needed to initiate rifting that began millions of years ago. Eastern Africa is being torn apart along a classic continental rift system called the East African Rift System. The rift runs north to south through east Africa for about 5,000 kilometers and stretches from the eastern border of Congo to easternmost Madagascar. 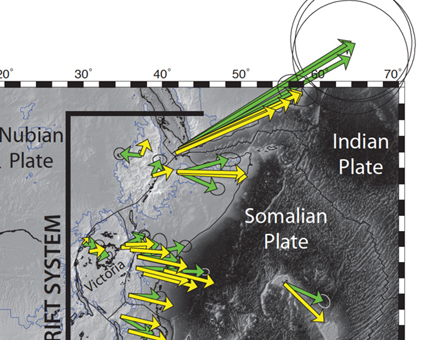 The principal tectonic action is the Nubian plate separating from the Somalian plate. Beneath the rift, seismic tomography has imaged a superplume of hot and viscous upwelling mantle that is thought to create at least four major domes of high topography. These domes generate regions of high gravitational potential energy (GPE) along the length of the lithosphere of the rifting zone. There is a longstanding debate over whether the major force due to the GPE gradients or from mantle upwelling acting below the lithosphere is the main driving force of present rifting. 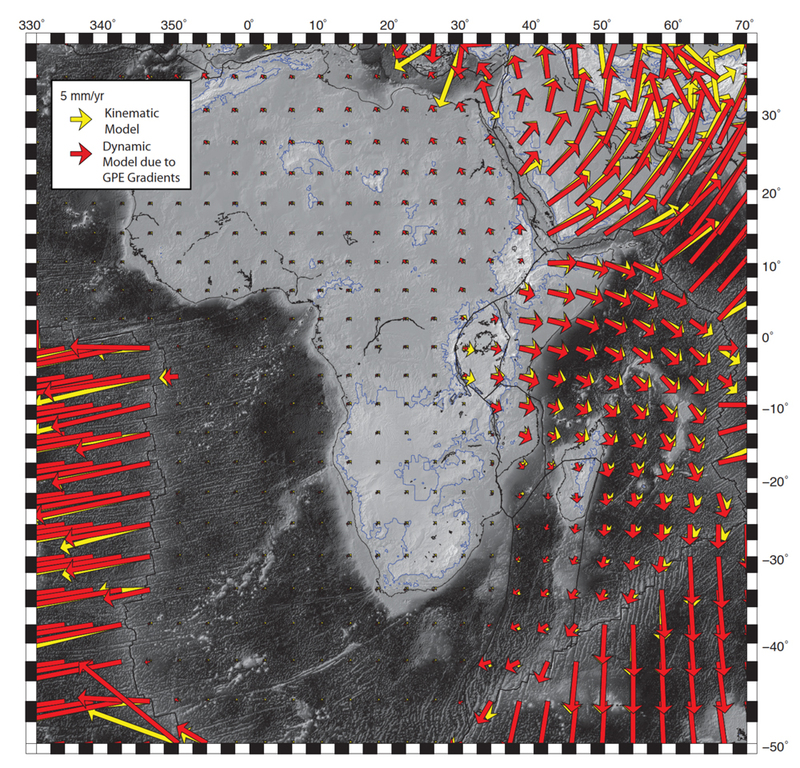 Geodetic data monitoring the millimeter-scale plate motions comes from permanent GPS stations that are part of Africa Array and temporary GPS stations deployed by scientists for short times over several decades. UNAVCO supported most of these GPS sites. Seismic data used to image crustal and mantle structure is the other crucial component that informs the modeling. The model that best fits the data shows that only forces from GPE gradients are necessary to sustain current rifting and that buoyancy forces from mantle upwelling would lead to faster rifting than is observed. Thus results from this work help to resolve the debate over which major force drives present-day rifting in East Africa. 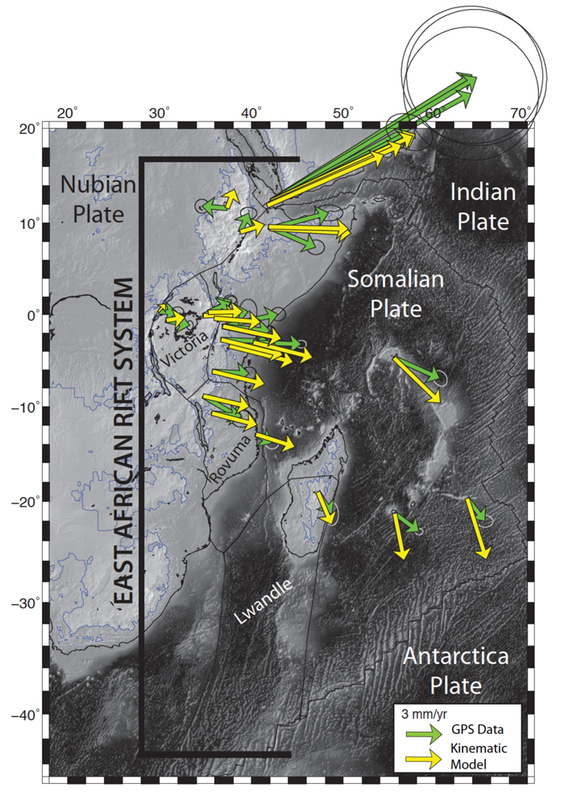 References: Stamps, D. S., L. M. Flesch, E. Calais, and A. Ghosh (2014), Current kinematics and dynamics of Africa and the East African Rift System, J. Geophys. Res. Solid Earth, 119, doi:10.1002/2013JB010717.